The Embroidery Workshop, by Pietro Longhi (1701/2-1785). 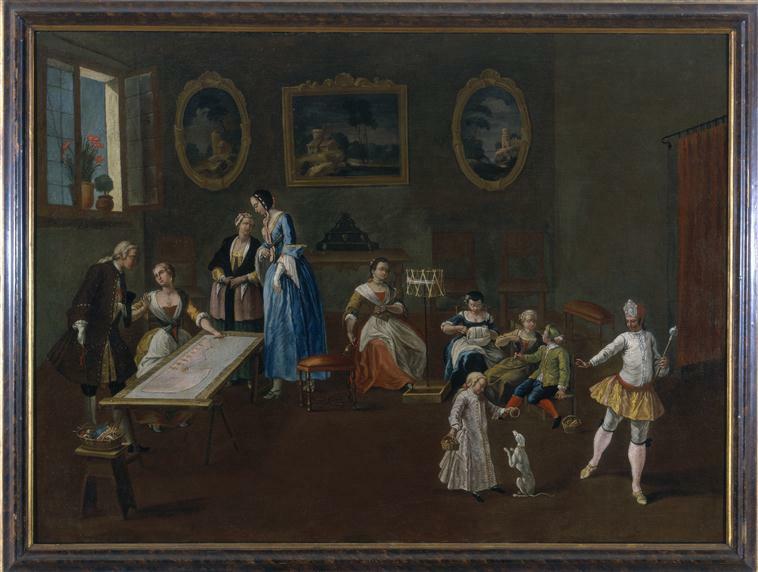 'The Embroidery Workshop' is an oil painting by Pietro Longhi (1701/2-1785; aka Pietro Falca), now in the Museo Correr in Venice. It shows a group of women being engaged in various activities related to embroidery. The woman to the left is working the front panel of a man's waistcoat. The man looking over her shoulders may in fact be the future wearer. In the middle is a seated woman spinning a thread, probably silk. On the reel on her left side are the unspun (silk) fibres; there is a spindle in her right hand, and the spun thread would eventually be wound around the spindle shaft. Another woman, further to the right, is making bobbin lace. Digital source of illustration and further information (retrieved 16 July 2016).